Our deployment journey started out with a boom. Literally. A tree fell on our house just before my husband, Matt, deployed overseas, and I knew the next six months were going to be a doozy. The "deployment curse" continued to wreak havoc over that time. Even a few days before Matt came home, I paid $800 in car repairs and enjoyed the thrill of a child with pink eye. 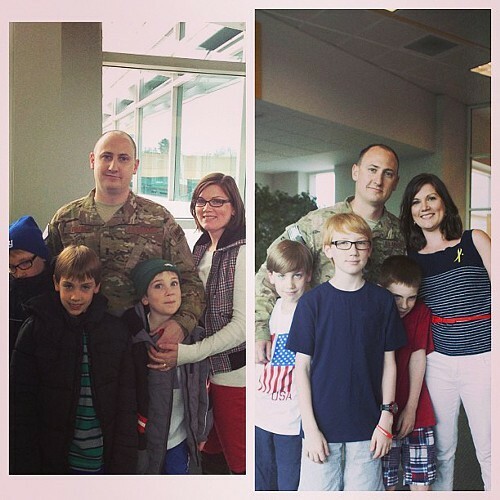 Matt's homecoming was filled with cheers and tears. Not by me. I was too happy, relieved, excited, nervous — don't make me pick an emotion — to make a sound. "I'll let you run ahead and hug him first," I told my three boys as we saw him coming. "But you better hurry." In that moment it didn't feel real. A flashback of the last six months clouded my mind. All the things we've been through, the tears we've cried, the nights I didn't sleep and the days I pulled the covers over my head and wished it all away — they are memories now. They've become harder to remember every day since Matt's been home. What will not slip away so easily are the lessons we learned about inner strength and personal sacrifice for a greater good. I do hope the frustration of dealing with no heat in the middle of winter and terrible single-parenting vacations will wear off — I'm not there yet. But all I learned about perseverance, self control and patience, I will not soon forget. It has taken us some time to readjust to being a family of five again. My boys and I had become a well-oiled machine, and throwing a fifth wheel in the mix has made for some bumpy rides. 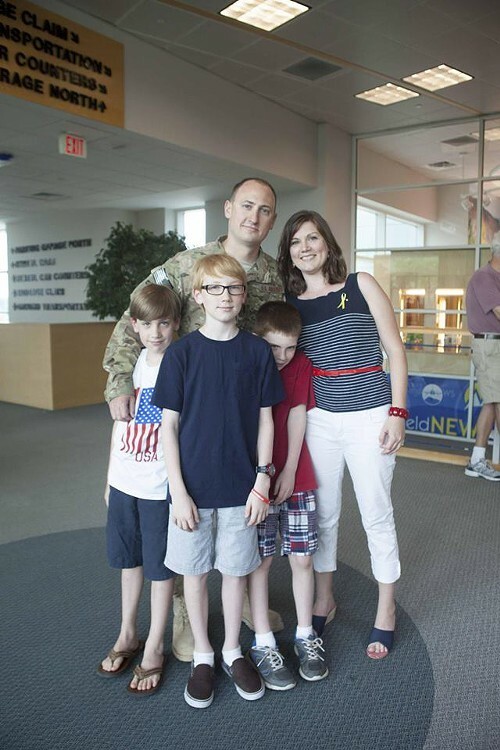 Matt has had to remember that his wife and children require more sensitivity and patience than the members of the military he's been surrounded by for the past six months. I am remembering that I no longer have to do it all. I am enjoying the phrase "Go ask your dad" these days. The boys are enjoying having their buddy back, but are also remembering that Dad is stricter than Mom, which I'm rather enjoying. Being the only bad guy wears on a nurturing mama's soul. We even look different — the "before" and "after" photos here tell a story. Matt is thinner, the boys are taller and my smile is way more convincing in the "after" shot. We are all stronger in a way a picture can never show. This deployment, our first, is over. The harsh reality of military life is that it won't be our last. Thankfully, we have plenty of time to recoup before the next one comes. There will be shorter separations until then. Once a month, we will spend our weekends Daddy-less while he attends drills. When the need for training arises, off he'll go. When an emergency or natural disaster comes, he'll be ready — and so will we. Believe it or not, so will we.